This tunic is a classic version of medieval underdress. It can be used as a single dress or as a part of more complicated garb with some sort of overcoat or surco. Lacing on the back and sleeves allows to make size adjustments easily. Matching surcoat is available in the store. Flax linen is 100% natural, it looks very authentic and this unique fabric gives great heat protection and it's light and dense at same time. This design seems to be simple, but it's very well though out and dress looks great at almost any figure. There are long lacing along back and sleeves. Please note, the tunic of size 6, 8, 10, 12 has the side bust darts for better shaping. Also, if the difference between your waist and hips circumferences exceeds 9 13/16 in (25 cm), the dress won't fit tightly. Hi! I love the look of this dress and I’m considering getting it for my wedding. Im debating on the white linen or the natural linen. Is the white linen a classic bright white color or is it more off white? I can never really tell when looking at the colors online. Thanks! Hi Rayla, white linen is a classic bright white color. Is this the same cut as the Elise, but with trim? Hi Janessa! The pattern of the Red Elise dress differs from the Sunshine Janet one. The dresses are different and fit differently. Can this dress be made in other colors? Yes, it can be made in other colors in custom size. Is it possible to get this dress with either the silver or gold forest trim? I was looking at the "Sunshine Janet" style as a possible bride's maid dress to complement the "Forest Princess" set. Yes, the dress can be made with the Forest trim, no extra. Just mention the trim in the comments to your order. Fixed size dresses are 58" (148 cm) long in sizes 0–8 and 59" (150 cm) in sizes 10–12, please note that our sizes are different from US, EU and UK systems, please check the size chart. Would this dress work under the "Green Sleeves" dress or would it show at the neck do you think? We wouldn`t recommend wearing this dress under the Green Sleeves dress, it wouldn`t be comfortable. Originally, the dress is supposed to be worn over our Medieval Exclusive XIV Century Style Chemise Underdress. Also, our Medieval Flax Linen Chemise is a good basic chemise to wear with the dress. Hi im from Singapore. if i will to order will it reach to Singapore? Yes, sure, we ship worldwide. Just choose Singapore in the country list in your cart and enter your address! I was reading that the Sunshine Janet sizes fit those who are 5 foot 6 inches tall. I'm 5 foot 10 inches tall. Should I custom order one to fit my height? I love the natural color with blue trim. The dress in fixed size may be a bit short for you, we recommend ordering it in custom size. Hello, I love the Sunshine Janet dress. I already have the lost princess velvet vest in midnight blue and I think it would go well with the dress. I was reading the sizes and I'm worried about the length. I'm 5 foot 10 inches tall. Will I need to custom order for length? Indeed, you may get an interesting and nice look combining the dress with the Lost Princess corset. Can this dress be made in fixed size 0 without a trim (just natural colour with blue lacing)? Thanks! If you order the dress from stock, any modification is possible as the dresses are already manufactured, sorry. The dress in custom size can be made with no trim, just mention it in the comments to your order. Wow, great to hear from you! Thank you very much for your feedback, we`re really happy the dress fits you. Have a great time at the faire! Hi there! I'm interested in the Sunshine Janet dress. I plan to wear it to a upcoming renaissance faire and halloween, but size 8 is not in stock. While I have not decided on the details such as trim yet, will you be able to make a Sunshine Janet in 8? I hope to hear back from you soon, and I'm happy to make a deposit if needed. All the items which are not available in stock you can order in cusom size. If you do so you can choose a fixed size 8 or enter your measurments and in this case the dress will fit you in a best way as it will be made specially for you. Also in this case there are more options for material and the trim. Hi does the lacing come with metal rings? If so. Can I have it so the lacing run thru fabric loops instead? Yes, the lacing goes with the metal rings on this model. Unfortunately we don`t make it with fabric loops, but we can make it with no loops, so you could put them there by yourself, if you`d like to. Does this dress work without undergarment? Is the fabric thick enuff to look well on without? Originally this tunic is meant to be worn with a surcoat. We produce this tunic of a linen flax which is thin enough, and if the color is white or natural it can see-through on the sun. So if you plan to wear this tunic as a separate dress, it`s better to choose a colored one. Hi. I wonder when this dress vill be available in size 12? And if I have to pay extra if I want the dress in blue or midnight blue in fixed size? To date we don't have any accurate info about restocking time for this item, sorry. Yes, if you want this dress in different color - please order it in custom size, we have it in stock in Natural color with blue trim only, sorry. Hello, I am looking at the Sunshine Janet tunic (without the surcoat). Can that tunic be worn alone without being too transparent and showing undergarments (such as bra)? Is it opaque enough to be worn as a dress on its own? I am particularly wondering about the natural linen (as pictured on the model) and brown colours. I am also wondering if it is possible to make it without trim for a plainer, more everyday look. Thank you. Natural and brown color flax linen that we use for this tunic are not transparent, please do not worry. Of course, the tunic can be made without trim, simply add a comment to your order. Is there any way to have trim like that of the lady of the lake dress if not what would you recommend. 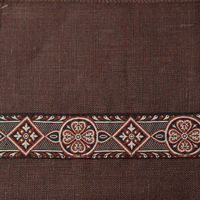 Can be made with narrow Lady of the Lake trim for $20 extra, simply add a comment to your order. I love love love my sunshine Janet dress! I will never buy another cheap costume again! The dress looks great, I'll be able to dress it up or down. ThAnks so much! Great, thanks for your amazing feedback, Shannon! Always welcome back! Is there somewhere I can view all the different colors of the available lacings? Hi, could you please post a picture of the combinations yellow dress with blue trim and violet dress with blue trim? I have a hard time visualizing it and am wondering if this would work at all? Are these fabrics light or dark tones of yellow/violet? Also, what do you think of white or silver lacing with that? Thank you very much! :) I love your clothes! 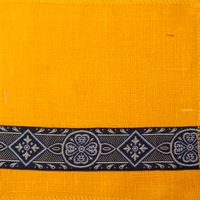 Here are the swatches of yellow and violet flax with blue trim. We recommend gold lacing for the yellow dress, and black or silver lacing - for the violet dress. Hi! What color of trim and back lacing do you recommend for the dark blue dress? Midnight (dark blue) flax dress will look great with blue trim and black or silver synthetic lacing. More contrast combination with red braid and dark red lacing looks very impressive. Welcome! We use only not pre-shrunk linen, sorry. Hand-washing is allowed but not required, the dress is machine washable. Shrinkage can be avoided by following our simple care guidelines. Also we always add allowance for shrinkage of linen. It is hard to picture what this dress would look like in a different color- I was thinking about ordering it in brown flax with brown trim and dark red lacing. Does that seem like a good color combination? 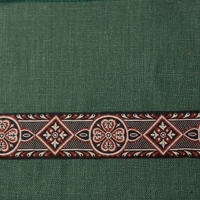 Or possibly green flax with brown trim and dark red lacing. Also, someone else asked if the neckline could made wider-how much wider could it be made? Thank you! Both versions will look amazing, green dress with red lacing and brown trim will be slightly brighter. The neckline can be made slightly wider, for about an inch or so (~2.5 cm). Can be made without lacing, then the sleeves will be not so tight-fit, something like sleeves of “Knyazhna Helga” chemise. We have to use express delivery for guaranteed arrival in time. Please specify your full height, chest and waist circumference, so we could assist you in choosing the right size. Do the in-stock dresses come with the blue trim? Yes, fixed size dresses are natural color with blue trim. Hello, I was wondering if this dress could be made with a different color of lacing. Thank you. Hi! Is it possible to order this dress with trimming on the neck area? And is it possible to make this area wider aswell? I was thinking about ordering this dress with the "mistress" corset, do you think they will go well together? Thank you for making such lovely dresses! Wider neckline - doable, to add trim on the neckline - $10 extra, simply add a comment to your order. This tunic works good with the “Mistress of the Hills” corset, you're welcome! DOES THIS DRESS COME IN A FIXED SIZE 12, AND WHAT COLORS ARE AVAILABLE ? I REALLY WOULD HOPE FOR A BROWN OR A GREY . YOU KNOW , OLD MEDIEVAL COLORS . I AM JUST CRAZY ABOUT THIS DRESS AND I WANT TO ORDER IT . I CANT GET MY MEASUREMENTS RIGHT, BUT I WEAR CLOSE TO A SIZE 12 . Fixed size dresses come in natural color. Available sizes are shown at the top of description ("in stock" tab). Can be made to order in brown color (custom size). We don't have any gray linen, sorry. I am considering ordering the natural flax that is shown; however, my concern is cleaning/staining. The festival near us can get dusty. 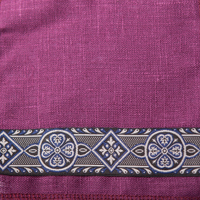 How easy is this fabric to clean? How visible would dust be on it? Thanks! Being at the festival you can clean off dust using a brush, then rinse the clothes in clean water and set it out to dry in shade. Also here are our standard care instructions. The tunic is not tight, plus back lacing allows to make size adjustments easily. Green linen is shown in "Forest Princess" and "Autumn Princess" dresses - it's emerald green. We ship to Australia, we do ship worldwide - you're welcome! such a beautiful dress! Is it possible to have this dress without the trim? and how much will that cost? Thank you! This dress w/o trim will cost $10 less. Please email us at contact@armstreet.com, and we'll send you an invoice. are the sleeves on the flax linen sunshine dress detachable? Hi. I am thinking to buy this dress (sunshine janet). I have two questions: Is the linen washed? I am a bit worried that it will shrink if I wash it. The color on the picture is that the natural flax color, or is it white? Kind regards, Beate S. Rudaitiene. Linen is not pre-washed. Model wears "natural" color tunic. Model wears natural color dress with blue trim. I got married in this dress in november its beautiful. Thank you ArmStreet!